Each year, a new influenza vaccine is formulated and distributed, and each year, viruses develop ways to evade them. Imagine you work in a high-security building. It uses facial recognition technology to keep out known intruders. It works well, until someone figures out how to use clever makeup, or even just grow a mustache to game the cameras. No matter how often the intruders are caught, new infiltrators find new disguises to help them get in. That’s a little bit how the immune system works, and the flu virus is gaming that recognition technology. It sneaks past the body’s immune system to cause misery and mayhem, even as new vaccines update the biological equivalent of facial recognition software. Flu vaccines are never as effective as other vaccines, and the current vaccine only provides partial protection against the ongoing flu epidemic. The Centers for Disease Control and Prevention plans to release preliminary data on Thursday about how well the vaccine has been working this year. It doesn’t look good. A Canadian study showed only about 17 percent protection against H3N2, the most common strain this year, and 50 to 60 percent protection against the H1N1 and influenza B strains. In a severe flu season, like the current one, that can mean a lot of deaths. Every year, flu kills between 12,000 and 56,000 people, the CDC says. This year is shaping up to be on the high end of that range. That’s why teams of scientists are working on what’s called a universal flu vaccine. The hope is to develop a formulation that will recognize something a little deeper than just the “face” of the flu virus — something that doesn’t change from one virus to another, and that doesn’t mutate over time. That could lead to a flu vaccine that people would just have to get once or twice over a lifetime — one that would protect against new mutant strains of virus as well as the “drifted” strains that pop up during the flu season. A universal vaccine would also use better technology than the current most common technology, which relies on a very old-fashioned and error-prone process starting with chicken eggs. This process itself can cause the virus to mutate, recent research shows. It also takes months and can break down at any of the many steps. It’s virtually useless for fighting new pandemic strains of virus that could sweep the world in weeks or months. “If you really want to take influenza vaccinology to where it belongs, hopefully, we should never have to grow a virus,” says Dr. Anthony Fauci, director of the National Institute of Allergy and Infectious Diseases (NIAID). Some vaccines do skip this process and are made using bits of genetic material from flu virus and grown in either dog kidney cells or in caterpillar cells. They’re a little quicker to make and some tests indicate they may protect better than standard flu vaccines, but they are still based on the constantly changing “faces” of flu viruses, and thus have to be updated annually. Viruses are small and simple. 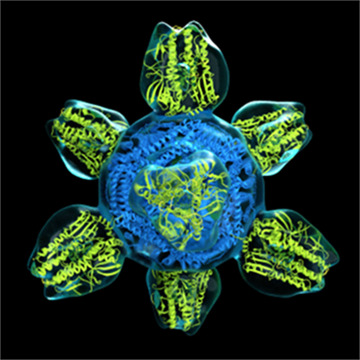 Influenza A has just 11 proteins, and just a few of them are accessible on the surface of the virus, where the immune system can “see” them. Influenza can change the appearance of these surface proteins easily and quickly. So a better vaccine will have to go deeper, and help the body’s immune system recognize a less-changeable part of the virus. “There’s a lot of talented people working on this issue,” said Robert Johnson, director of the Influenza and Emerging Infectious Diseases Division of the Biomedical Advanced Research Development Authority (BARDA). BARDA, part of the Health and Human Services Department, oversees and pays for research into new technologies such as advanced flu vaccines. Peter Palese, a microbiologist at the Icahn School of Medicine at Mount Sinai in New York, has a team working on a vaccine that goes after one unchanging target. One of influenza’s most prominent surface protein is hemagglutinin — the “H” in a flu virus’s name. It’s a mushroom-shaped structure and while the “cap” of the flu mushroom is easily seen and also changeable, the stem is less visible and also mutates less. Palese’s lab is focusing on ways to stimulate the immune system to recognize the stem or stalk of the hemagglutinin protein. At the NIAID, Dr. Jeffery Taubenberger and colleagues worked up a vaccine cocktail that uses four different types of hemagglutinin from avian flu viruses. Why bird flu? “The ultimate sources of pandemic flu strains are birds,” Taubenberger said. From H5N1 to H7N9, the viruses that threaten to cause havoc are bird flu viruses. The H1N1 virus that caused the 1918 pandemic originated in birds. Taubenberger was originally trying to make a vaccine that could be stockpiled for quick use in case a pandemic does start. But it turns out that using avian flu viruses as the basis for new vaccines also stimulates what’s called a broad response. Animals vaccinated with the cocktail were protected against strains of flu virus that were not included in the cocktail. That’s sounding close to a universal flu vaccine. How does it happen? Avian viruses don’t have the same cloaking technology that human flu virus strains employ, Taubenberger said. As flu viruses evolve and replicate inside their human hosts, they display sugars to hide their “faces” in a process called glycosylation. “Avian viruses don’t have those,” Taubenberger said. Plus, his team’s vaccine generates antibodies against the hemagglutinin stalk. At least, it does so in mice and in ferrets, the animals that get flu in the way most similar to humans. Taubenberger’s discovery made headlines in 2015 but he came up against a wall that demonstrates why vaccines take so long to develop. He was making the vaccine using virus-like particles or VLPs. “They are empty, non-infectious viruses,” he said. They’re like the shell of the flu virus, without the inner workings. Pricey vaccines don’t sell, and they don’t attract the drug companies that would be making and selling them. So his team worked up a cheaper approach, by simply chemically damaging flu viruses so they aren’t infectious but still look like flu viruses to the immune system, and making the cocktail from those. “It’s looking good in mice and ferrets,” he said. “The only way to really evaluate this is going to be in humans,” he added. He’s planning that study now. Will this vaccine be a truly universal flu vaccine, one that protects people forever against all flu viruses? “I personally think that is just too tall of an order,” Taubenberger said. “What this vaccine seems to do is provide protection against serious illness. You wouldn’t get pneumonia, you wouldn’t be hospitalized or die. You might get a mild illness for a few days and recover.” It might also limit how much you spread the virus around to others, he said. Most of the next-generation flu vaccines aren’t going for the gold, but instead aim to improve on seasonal influenza vaccine approaches. One vaccine in the works makes use of one of the less-changeable parts of the flu virus called M2. The ReDee vaccine made by FluGen, a spinoff from the University of Wisconsin–Madison, is not meant to be a completely universal vaccine, but might protect better against a range of flu strains. It’s a genetically engineered whole virus, one that causes a limited infection in the body. It’s squirted up the nose, and phase 2 studies in people start this year. These studies aim to show that the vaccine is both safe and works as intended. Another approach uses a pill instead of a needle. The VXA-A1.1 vaccine being made by VaxArt doesn’t use eggs but employs an extra ingredient called an adjuvant to stimulate the immune system. The company just finished a phase 2 study in people who agreed to try the pill vaccine and then be deliberately exposed to flu. It reduced the infection rate by 48 percent — not a home run, but better than the 38 percent reduction in people who got a standard seasonal flu vaccine. What this vaccine seems to do is provide protection against serious illness. Canada-based Medicago uses virus-like particles that more precisely match circulating flu strains. Medicago’s are grown in tobacco plants, which the company hopes will mean fewer mistakes in production and much quicker production time. The Medicago vaccine is in phase 3 studies, the last stage of human experiments before a company seeks approval to actually sell a drug or vaccine. The company says so far, the vaccine is safe and produces a robust immune response, but it has not conducted studies in which people are challenged with flu to see how well it works in a real-world situation. The company is hoping to have it on the market by the 2020 flu season. It’s expensive to develop any new drug and often more expensive to develop new vaccines, which must pass extra hurdles of safety because they are used in healthy people. Two Democratic Senators, Ed Markey of Massachusetts and Richard Blumenthal of Connecticut, plan a news conference on Thursday to call for a $1 billion investment in developing a better flu vaccine.